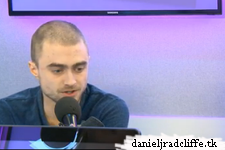 There are two more Radio interviews with Daniel Radcliffe and James McAvoy which were already recorded back in November in promotion of Victor Frankenstein. First off BBC Radio 1's Movies with Rhianna (video, and the podcast download is also possible via iTunes.) Then second there CFM Radio (video).